When a person fails to pay their water utility bill, their water service can be disconnected. Lack of water in the home compromises health, and renders housing legally uninhabitable and untenantable. Shutoffs also pose a financial burden; in addition to the original debt, there are usually fees associated with late payment, notice of an impending shutoff, and service reconnection. 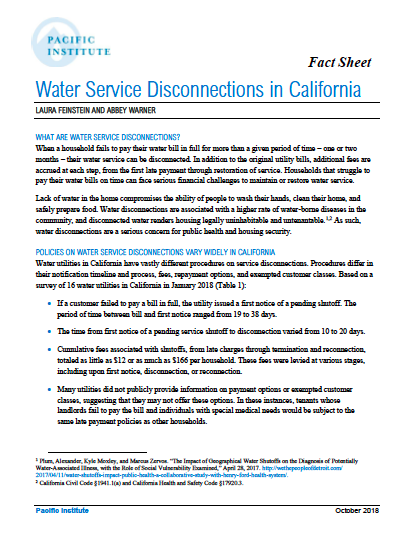 Water utilities in California have vastly different procedures on service disconnections. This fact sheet, based on a survey of California water utilities, examines practices and fees associated with water shutoffs in the state. It includes recommendations for water utilities to reduce shutoff rates and increase revenue collection by improving debt and service disconnection practices. The recommendations would allow some residents to avoid water shutoffs, thereby supporting public health and housing security.